The way that public transit riders reach their nearest stop to home could make an important difference in the jobs available to them. USC researchers found that this is especially true for low-wage workers in suburban areas with limited rail, bus, and other public transportation services, according to a study from the journal Transportation Research Part A. Researchers found that car commuters in low-income neighborhoods in San Diego have about 30 times greater job accessibility than those who take public transit. 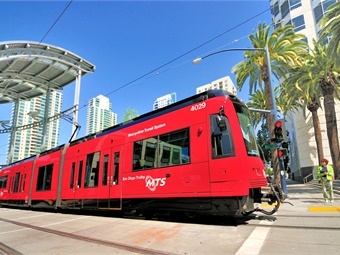 The team decided to look at San Diego because of its similarities with many other large cities in America’s Sun Belt, including Dallas, Atlanta, Phoenix, Orlando, Las Vegas, San Jose, and others, which tend to be more sprawling and have less extensive transit infrastructure. "You really have to think about the entire trip for riders when it comes to getting from one point of, for example, affordable housing to another easily accessible point of income generation." The different ways riders leave and arrive at the stops closest to home and workplaces — what researchers term “first and last mile access” — can close this gap even more effectively than more traditional and costly public transit measures, like increasing transit frequency by adding buses and drivers. Those short distances that bookend a commute are crucial, according to the study’s lead author, Marlon Boarnet, professor of public policy and chair of the department of urban planning and spatial analysis at the USC Price School of Public Policy. “Transit providers think about the system they provide and focus more on headway reductions, and you really have to think about the entire trip for riders when it comes to getting from one point of, for example, affordable housing to another easily accessible point of income generation,” he said. Security and sustainability are among the problems that are the focus of multidisciplinary USC researchers, including those at the METRANS Transportation Center, which supported the study. METRANS is a collaboration of the USC Price School, the USC Viterbi School of Engineering, and California State University, Long Beach. It is dedicated to solving transportation problems of large metropolitan regions through interdisciplinary research, education, and outreach. Boarnet and the team focused on the availability of jobs for low-wage workers, who are more likely to depend on public transportation for getting around. In San Diego County, households in the lowest-income neighborhoods are nearly three times more likely to have no car compared to the county average. The researchers identified a group of 37 census tracts that have a large share of low-income workers, as defined by the U.S. Department of Housing and Urban Development. They then compared job accessibility, measured as available low-wage jobs within a half-hour commute, among these tracts. Finally, they cross-referenced transit network data from the San Diego Association of Governments to create a model for transit travel time to and from all census tracts in San Diego County across different segments of a trip, including in-vehicle travel time, time spent waiting while transferring on transit, and time spent on getting to or leaving transit stops. They did the same calculation for car trips. The researchers found that low-wage workers who drive in San Diego have access to more than 30 times the job opportunities of the workers who depend on public transit (444,677 jobs vs. 24,703). Researchers found that driving or biking to a transit station more than doubled the number of jobs that could be reached, by transit, in a 30-minute commute. Boarnet said the findings indicate that one of the significant personal transportation developments in the last several years, the growth of ridesharing services like Uber, Lyft, and others, can help workers make up the “first mile/last mile” part of the job accessibility gap. Bicycle access, and first-last mile bike-share programs, can be almost as effective at improving the job access from transit. Los Angeles Metro has recently added bike share hubs to areas like Pasadena and the Port of Los Angeles.